The Dare2Soar Foundation is an organization created to empower 7th to 12th grade female students to strive to reach the pinnacle of success in their personal lives as they endeavor to pursue secondary education and professional careers. Dare2Soar carries out its mission using the acronym SOAR, (S) Stronger Voices (O) Overcome (A) Achieve (R) Rise. In addition to advocating for youth empowerment; the Dare2Soar Foundation will provide a powerful message of inclusion, unity and will demonstrate a devoted commitment to the development, advancement, and empowerment of young women through scholarship, mentorship and internships. 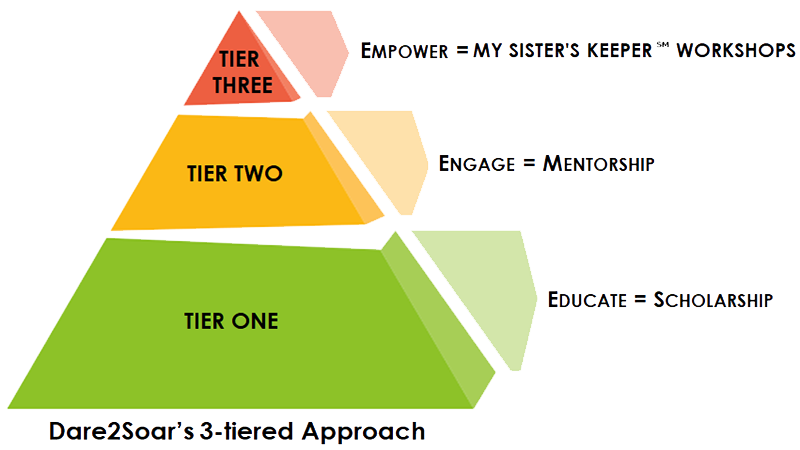 This mission of Dare2Soar Foundation is to empower 7th to 12th grade female students to soar through mentorship, educational and leadership programs that foster personal growth in their personal and academic lives. To celebrate 7th to 12th grade female students by empowering, engaging and educating them to have Stronger Voices and Dare to Soar! To see all women, fulfill her purpose! We value the voices of the youth in our community regardless of race and socioeconomic status.